I grew up with very strong food traditions in my home. Christmas meals, especially, were filled with tradition and usually included the same dishes year after year. I loved those meals and the feelings that they evoked. Food has a way of really tying a family together. Once I was married though, I learned that other families had their own unique traditions (and non-traditions) that were very different from what I had grown up with. So I vowed to find a way to merge all of our traditions together into new and unique experiences that were ours. Christmas eve at my house was a very traditional Polish meal – mushroom soup, fish, and pierogi were the focal points. Christmas morning was probably my favorite – puffed pancake with strawberry sauce, Christmas tree coffee cake, and mini-blinis. And then Christmas dinner was always a fancy meal – crown rib and ham with lots of sides. For my husband, the food traditions were minimal. My father-in-law needs ham, baked beans and coleslaw in order for it to feel like Christmas. The food was simple, but the memories they evoke are still just as strong. We rotate who we spend Christmas with each year. When we go to my parent’s house for a few days, we obviously eat the way I was accustomed to. But when we stay home, my goal is always to merge our traditions. Usually Christmas eve is spent with my in-laws. I bring along some homemade pierogi to go with the baked beans, coleslaw and ham. It works perfectly. On Christmas morning, I add some elements from my mom’s breakfast and some of our favorites as well. Because we spend Christmas day alone, the meal is pretty simple, but I try to make one or two of my mom’s dishes along with some new ones that are unique for our family. Merging old traditions…creating new ones…enjoying wonderful food with my family…it all works for me! 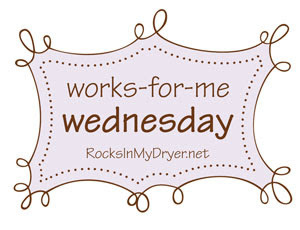 Stop by Shannon’s blog for more WFMW. Great tip! We’ve had to do this as well. My mom always made seafood on Christmas eve (oyster stew, sauteed clams, scallops and deep fried veggies). My hubby didn’t like oyster stew so I began making clam chowder on christmas eve. We do cinnamon rolls on christmas morning.